Imagine grocery shopping once-a-week or less, eating healthier, and having more free time--all while saving money. Sound too good to be true? For the Economides family, it's a reality, and it can be yours too. What could the average family do with an extra $3,000 a year? America's Cheapest Family(R) shows you strategies, tips, tools, and tricks in Cut Your Grocery Bill in Half, so you can achieve huge savings year after year. It's a fact, the Economides say, saving money on groceries is one of the quickest ways to start making a positive difference in your family's financial future. And these tips and strategies can work whether you're shopping for seven or for one. "Many people think that it's impossible to reduce your grocery bill by 50%. But you can. 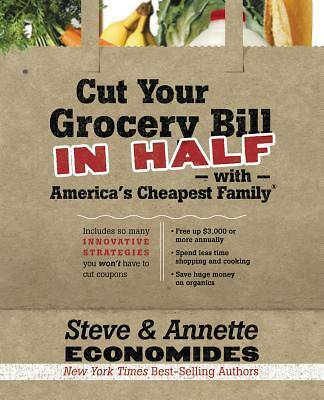 Steve and Annette Economides provide step-by-step instructions in "Cut Your Grocery Bill in Half." Tools that are practical and easy to follow. No special shopping or cooking skills required. Anyone can see a surprising reduction in their grocery budget if they follow the Economides' methods. And, best of all, the savings begin right away. You don't need to finish the whole book to benefit. You'll find money-saving ideas that you can put to use in the first chapter, and every chapter thereafter. Normally I advise people to check books out of the library and save the cost of the book. But this is one do-it-yourself guide to lower grocery bills that you'll want to have on your bookshelf or kitchen countertop." "If you are eager to save on groceries, but don't always have the time to clip coupons, this book is for you It's perfect if you're interested in more ways to cut costs, reduce waste, and get organized. This is an awesome book for the novice or the skilled cook." Tawra Kellam and Jill Cooper--editors of LivingOnADime.com and authors of "Dining On A Dime Cookbook"
"I've known Steve and Annette for several years and they definitely live what they believe. If you're serious about spending less money at the grocery store, this book offers some practical ways to achieve your goal. When it comes to stretching your dollar, I know of no one with more experience than Steve and Annette."